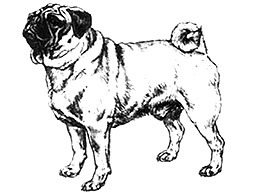 ABOUT THE PUG - Pug Club of Victoria inc.
never to appear low on legs. wrinkle is unacceptable and should be heavily penalised. exaggerated or showing white. Free from obvious eye problems. Ears: Thin, small soft like black velvet. Two kinds – ‘Button ear’ – ear flap folding forward, tip lying close to skull to cover opening. ‘Rose ear’ – small drop ear which folds over and back to reveal the burr. Body: Short and cobby, wide in chest. Ribs well sprung and carried well back. Topline: level neither roached nor dipping. well-split-up toes; the nails black. cheeks, thumb mark or diamond on forehead and trace as black as possible.